LOTTA: Questions on Matmara:Whose interests is the government serving? Questions on Matmara:Whose interests is the government serving? GUWAHATI:The All Assam Students’ Union (AASU) today warned the State Government of a vigorous agitation in case the Government fails to keep its words on protecting the Sissikalghar-Tekeliphuta dyke in the about one-and half-a-kilometre stretch of Matmara area expeditiously. The repeated failure of the dyke in that area since 1996, has eliminated a good number of villages and pauperised thousands of people. Several educational institutions have also been washed away or buried under sand by the Brahmaputra and a number of Government offices and a vast area of have been buried by the river under the sand it has deposited in the area. The schools washed away by the Brahmaputra include Matmara LP School, R K Baligaon LP School, Janjhi LP School and Karshing Katang High School. 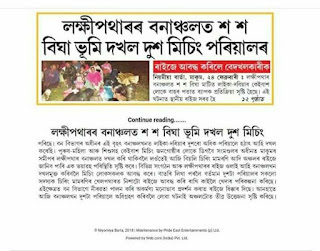 Authorities of the All Assam Miri Higher Secondary School, which is the first Mising higher secondary school in the State, were compelled to shift their school to safer areas for the third time now due to the sand of the Brahmaputra making it impossible for them to reclaim the school. Stating all these, AASU organising secretary Jagadish Dutta, who is also the general secretary of the Association of Past and Present Office-Bearers of Cotton College Union Society, said that the State Government had failed to discharge its duties to rehabilitate and compensate the Matmara flood victims.The failure of the dyke in Matmara area has also posed serious threat to the famous river island Majuli, Dutta said and informed that preparations were on to take the matter to the court also.Floods have made life miserable for almost the entire population of the Dhakuwakhana sub-division. The 38-km long Dhakuwakhana-Gogamukh Road, which is the only road connecting Dhakuwakhana with Gogamukh, is now in such a wretched condition that it takes over two hours to travel to Dhakuwakhana from Gogamikh or vice versa, he alleged. Though the Government engaged Geo-textile Fabrics, an Australian company to implement a geo-textile project for the protection of the dyke in Matmara area, the implementation of the scheme is yet to start. The deadline fixed for completing the scheme was fixed in March, 2009, said Dutta.The Guwahati-based students of the area have been meeting the Chief Minister with the prayer to protect the Sissi-Tekeliphuta Dyke in Matmara area, since 2001. 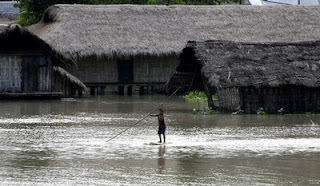 The leading citizens of the area also met the Water Resources Department Minister Prithivi Majhi on several occasion.But the Government is yet to take concrete steps to save the people of the Matmara area from the vagaries of the Brahmaputra, he said. Giving an example of the functioning of the Water Resources Department, he alleged that the Department had told him in reply to his queries that an amount of Rs 2 crore was spent on erecting a bullhead for the protection of Matmara area, including Dhakuwakhana town (Phase-I) in February 2006. A similar amount was spent on another bullhead to protect the area with a similar structure in the same month of the same year. Dutta had applied for the answers in accordance with the provisions of the Right to Information Act.But, he said, the fact remained that there was no bullhead constructed to protect the area from the floods of the Brahmaputra.